This lovely sweet-and-sour side dish is a perfect refresher with a rich, braised curry. Just pour over the vinegar syrup dressing and serve it immediately. To make the syrup, place vinegar, sugar, salt and ½ cup of water in a saucepan and bring to a simmer, stirring until the sugar is dissolved. Allow to cool to room temperature. 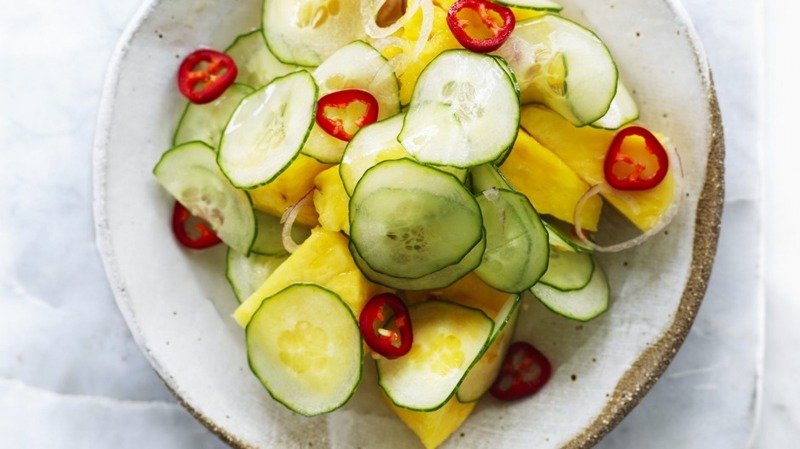 Combine the cucumber, pineapple, eschallots and chillies in a non-reactive bowl, pour the syrup over the top and serve immediately at room temperature. You can refrigerate for later use and it will become a more conventional pickle.